This afternoon, 10 (mostly) Americans gathered at our friend’s 300-year-old farmhouse in Lorraine to celebrate Easter the traditional way: consuming copious quantities of home-cooked food together. We had a couple vegetarians in our midst and based our feast on vegan delicacies, if you don’t count the marvellous braised lamb prepared by our host. I’ve been on a restricted diet for the past nine weeks. The purpose is to restore the skewed balance in my intestinal flora, as well as to cure recurring, painful oral infections (a horn player’s nightmare!) My inspiration for taking this on was the well-researched, humorous, first-hand account penned by a favourite author of mine, Cash Peters. His book on tackling Candida albicans overgrowth was a revelation to me and explained many other health issues I’d dealt with over the years. His blog is at least as fun as mine and is worth perusing, while you’re at it! Several doctor’s and nutritionist’s appointments, tests, and treatments of various sorts later (note to self: don’t mention colonic irrigation in a blog with a recipe,) I’ve settled into a rhythm of different foods, supplements, and the inevitable emotional/spiritual changes and vulnerability that come from willingness to heal. You’d think we all want to be healthy and whole all the time, and in theory, we do. The problem is, we get so used to our imbalances and pain that the work involved in transformation feels like an uncrossable chasm. Insane, no? I tend to treasure my convictions anyway (such as, I’m already a healthy eater – what could diet have to do with any of my problems?) so it takes some doing to change course. As it turned out, I’m missing an antibody that protects the mucous membranes along with having a yeast intolerance, combining to muck up the works. Stress definitely plays a role. Did I mention that I play horn for a living? It has been a hard regimen, I won’t lie. Maddeningly frustrating, sometimes, since food is one of the main ways we commune with others in social situations. Nine weeks in, though, my symptoms have disappeared, I’ve lost 6 kilos without trying, and my energy is good and steady. I’m slowly re-introducing foods banned on the Candida diet (hello, Rioja and potatoes! Berries and bananas, you’re next, my old friends!) Cooking has proven a challenge. We often make parallel meals, or mine serves as a side dish for my husband. Despite the restrictions, I’ve come up with some gorgeous new additions to the repertoire. You’d be surprised how a narrowed list of allowed foods can spark your creativity. 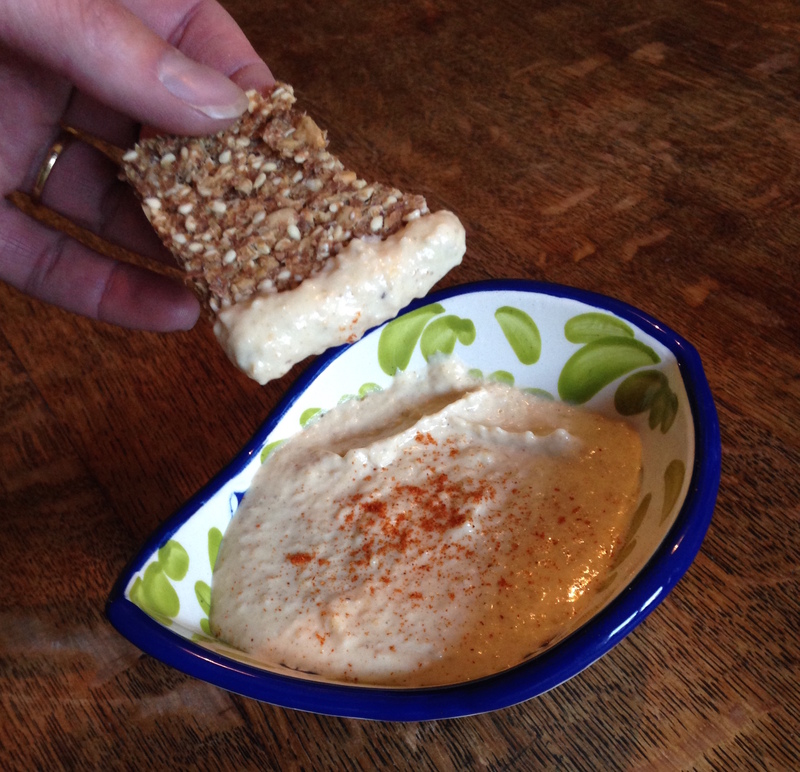 Here’s my vegan almond hummus that proved a massive hit at Easter lunch today. Since recipes don’t usually read as “a glob of this and some bits of that,” I’ve done my best to provide proportions for you. Feel free to play around with them according to taste. -1/2 cup almond butter, either blanched or natural. I used blanched today. Add all ingredients except paprika to your food processor (mine is a sturdy Magimix that would break your foot if you dropped it!) and blend until smooth, adding additional olive oil if needed for consistency. Add salt to taste. Pour into decorative dish and garnish with drizzled olive oil and paprika. Plop in a sprig of parsley if you’re feeling frisky. Enjoy with raw veggies, rice cakes, or whatever takes your fancy. The secret to a healing or detoxifying diet is to focus on and be grateful for what you CAN eat, rather than bemoaning what you give up. Come to think of it, that’s true in pretty much any area of life, isn’t it? This entry was posted in Food and tagged candida diet, Cash Peters, health, hummus, improvisation, recipe, vegan, yeast-free by tawalanki. Bookmark the permalink. Thanks, I hope you enjoy it! If you make it with brown almond butter, you may need a bit more olive oil, depending on how thick you want it and how sturdy your blender is.